Amazing!! Always fun to start the day seeing something I've never seen or even heard of before!! I love it!! Thanks so much for sharing this, Jose!! I hope you have a great new week!! Sure fooled me. I thought they were decorative sticks stuck in the sand in a garden area. Don't much like eels, though! :) Hope you've had a great Sunday! There are all kinds of strange creatures at the bottom of the sea. I would not want to walk on this sea bottom. Wow--- I've never seen these guys before. Great shot. 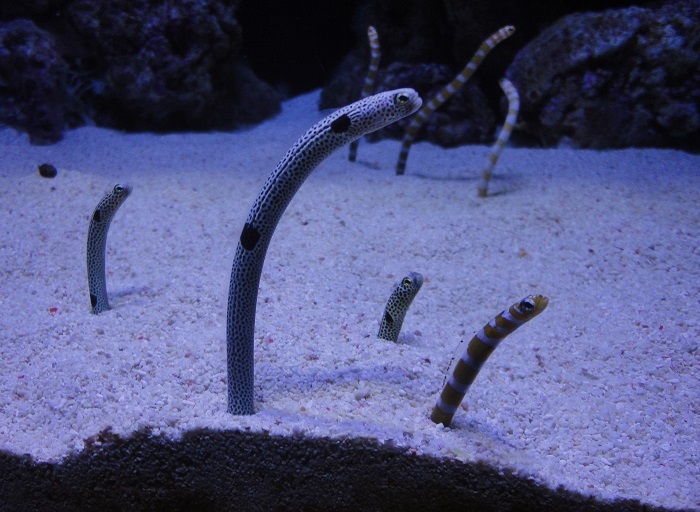 My sister has been in the Lisbon Oceanarium and has brought back a lot of unusual looking images like this one. Oh, my! These are very unusual. Nature is full of never ending weirdness. This is quite a good example. So eerie and pretty! I'd love to see them moving.